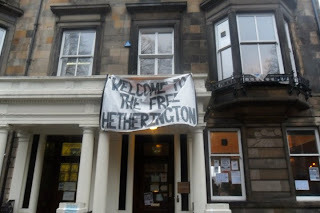 The Glasgow Defence Campaign salutes those students who occupied the old Hetherington Research Club at 13 University Gardens, Glasgow University last Tuesday. The space has been reopened as the Free Hetherington and will be used as a hub for anti-cuts organisation in the city, open to all. The GDC is holding a meeting in the Free Hetherington building on Wednesday 9 February, 7.30 - 9.30pm and we urge everyone to come along. The meeting will discuss how we can organise against the police harassment which is intensifying as the anti-cuts struggle develops. This key political question will be introduced by an FRFI supporter and set in the context of the class nature of the state and the repressive developments in British policing over the past 30 years. There will also be Legal Awareness training on Monday 7 February in the Free Hetherington building, between 4 and 6pm.